Here is a fine guitar from our collection. Antonio de Torres is the father of the modern guitar. The model he created borrowing from other Sevilla makers (principally Manuel Gutierrez and Manual Soto y Solares) is still the same model used by nylon string players through out the entire world today. Since World War II it has been called the “classical guitar,” but that term was never used nor even understood in Torres’ day in Sevilla. Outside of Spain, these were simply called “Spanish guitars,” and Torres’ primary market was among the Gypsy flamenco players who constituted the bulk of the Spanish market place 150 years ago. This instrument, typical of many of Torres’ instruments has a body size slightly smaller than today’s “standard” size. In Torres’ day it was expected that an artist would select the size and action that was right for their personal playing style, rather than force their hands to fit an instrument too big or too small for their physique and approach. While the label is the early version used by Torres which has “Almeria” and the full date of “1852” printed on it, and we can see a crude attempt to write “1858” under the damaged label, it is my belief that this instrument likely dates to late 1863 or early 1864, as nearly all the surviving Torres’ which still bear this label version have had the dates altered by Torres’ own hand to read either date. It is my theory that during this brief window of time, Torres ran out of his regular labels, and fell back on these earlier labels, altering the printed “52” part of the date to read either “63,” or “64.” I suspect the damage to the label happened when an unscrupulous dealer/owner thought that by removing this label and putting it into some other Torres-like instrument they could sell two Torres instead of one. However, based on my experience with other Torres of this precise period, I know that he was experimenting with additives which rendered his glue waterproof, making graceful removal of the label impossible, as we can see here. None the less, this instrument has a 25 1/2” scale (Torres worked in English inches, not European metric measurements), which is close (647 mm) to the popular 650 mm scale used by many makers today. However, Torres used many different scale lengths over his career, so this was by no means his “fixed” or standard string length, as some writers have erroneously attributed to Torres. This length is exactly double the length of the violin string length, and because the guitar’s first string is tuned exactly an octave below the pitch of the violin “e” string, the same size gut string could be used by violinists and guitarists for their instruments, the tension was exactly the same. The instrument has a two piece unmatched top of good quality spruce (if one ignores the prominent knot on the treble side of the top), with a 3 piece cypress back and sides of two pieces, semi-matched, with 1 mm rosewood spacers separating the cypress panels. The neck is Spanish cedar, with the usual grafted head with tapered rosewood head veneer, and the fingerboard is rosewood made by gluing two thinner 1/16” + veneers together to make the full thickness. 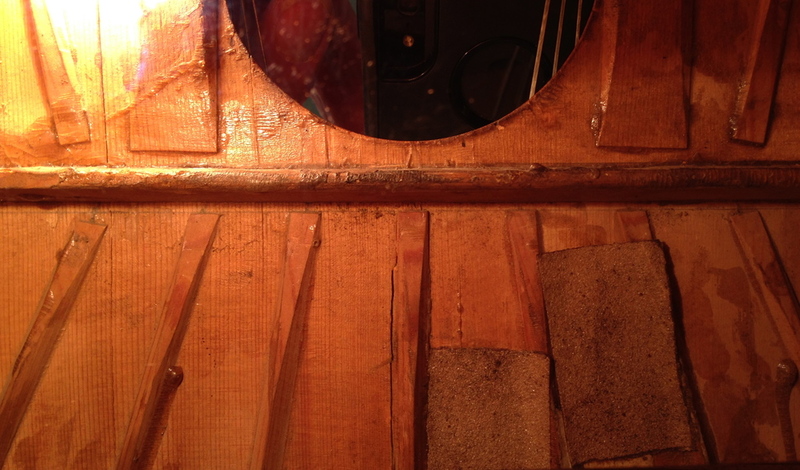 This is not a later re-boarding, as the instrument still retains its original brass bar frets which are graduated in width, the thinner frets used for frets 13-18. The two smaller holes in the peg head were a typical feature of 19th century Spanish guitars made with wooden pegs such as this Torres. 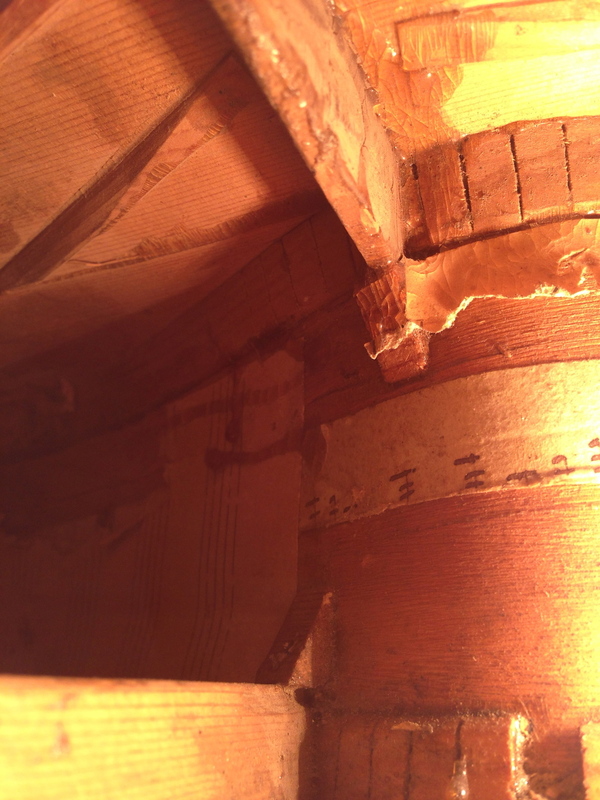 They were intended to tie a string or ribbon through these holes so that the guitar could be hung on a wall without endangering the pegs. Culturally, among Gypsies these were considered communal property and they did not come with cases, so the instruments were hung on the wall when not being played by whoever was around to play the instrument. Internally, it is fully braced with the usual Torres system of 7 triangular fans, two closing fans by the tail block, and the typical pencil lines used by Torres to lay out the fans and on the end of the neck to center the top. 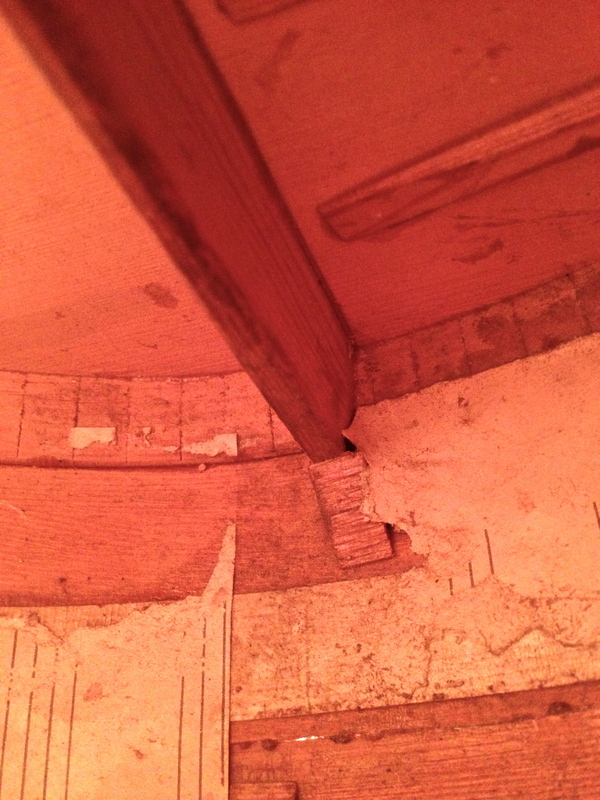 The linings are made of kerfed pine and the cross struts of both the top and back are set into the linings with such precision there is not even space for a razor blade to enter the joint. All cross struts are full depth and are made of fine grained pine, supported on their ends by triangular glue blocks of pine. The bridge is plain rosewood, as are the bandings, and the rosette is comprised of simple concentric rings. 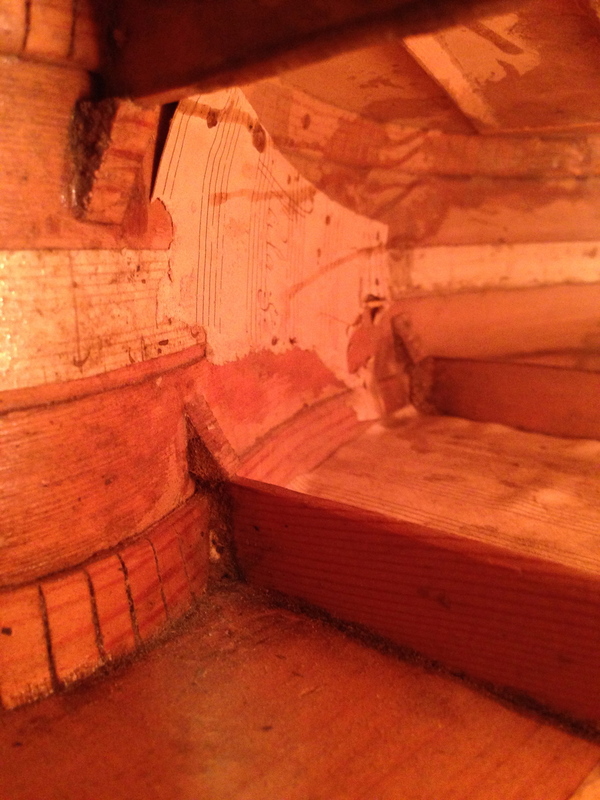 The instrument still retains its original varnish, but has suffered many previous repairs of varying skill, along with some worm damage. While it would be possible to restore this to playing condition, I have decided it has greater value leaving it as is, without any further loss of any original information. 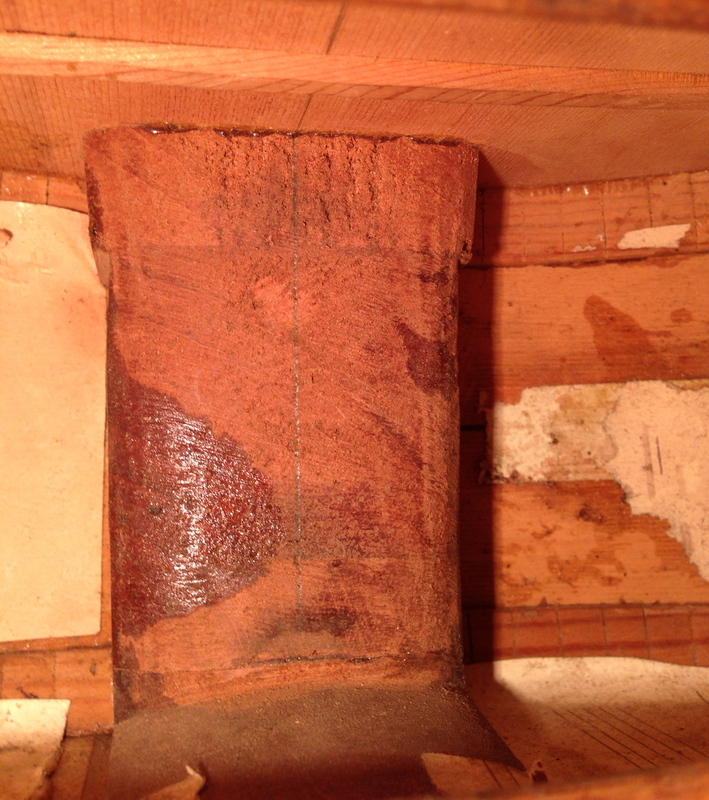 The action measures a scant 2.5 mm at the 12th fret and the instrument still retains its original nut and saddle, suggesting this is the way it was intended to be when it left Torres‘ shop. The neck geometry is still perfect despite the years of abusive playing this instrument has received, with a slight relief on the bass side and less on the treble side. This instrument once belonged to Matanya Ophee, who traded it to me in return for a restoration of his Gaetano Guadagnini II guitar to playing condition. At the time (1980’s), Torres instruments were selling for less than the cost of one of my Concert models today! This instrument was featured in the Vintage Guitar Classics # 9 magazine of 1997 (pp. 16-18), and more recently was exhibited at the Boston Museum of Fine Arts special exhibition called, “Dangerous Curves, the Art of the Guitar,” which took place in the year 2000. It can be seen on page 62 of the descriptive exhibition catalog. And visitors to the Bruné workshop are welcome to see and examine the instrument in person.